go to work, but you don’t have to be miserable. Whether you work from home or in a traditional office, your productivity levels are probably on your mind for a fair amount of each day. How productive an employee is impacts the employer’s bottom line, so it’s understandable that some people are preoccupied with efficiency. But improving output might not require as much sacrifice as you might think. In fact, it often comes down to the environment in which you work. 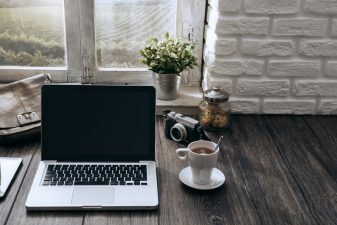 If you’re struggling to meet your goals when working at home or you feel the office could use a better setup for the sake of employee efficiency, here are some important tips to keep in mind. Physical clutter leads to mental clutter. In other words, your messy desk is going to make you feel distracted and unable to focus on the tasks you really need to get done. It can also make it impossible for you to find what you need. Around 19.8% of business time is wasted by employees who are searching for information that will allow them to do their jobs more effectively. If your workspace is covered in loose papers, trash, and other unnecessary items, you probably won’t be getting much work done any time soon. To make your desk actually work for you, invest in some storage options that allow you to organize the items you need to keep in a way that helps you find them more quickly. Throw out the junk, commit yourself to clearing off your desk on a daily basis, and add some wall shelving that you can use to store binders or display photos and certifications. The main thing is to get books, documents, files, and more off the desk itself and into well-organized containers. Not only will this get the clutter out of sight and out of mind, but it’ll ensure that you can access exactly what you need whenever you might need it. With a cleaner and more open space in front of you to work, you’ll actually be able to zero in on the tasks at-hand. You might not think the temperature of your workspace could have a significant effect on how well you focus, but science begs to differ. Although you can save anywhere from seven to 10% on your energy costs during the summer by setting your thermostat at 79 degrees Fahrenheit, studies show that you can maximize productivity by maintaining a temperature range of 68 to 77 degrees Fahrenheit. If you’re noticeably chilled or can’t stop sweating in your office, you’ll be fixated on how uncomfortable you are and won’t be able to work to your full capabilities. In fact, a new study found that only 16% of workers are satisfied with their office temperature and 89% say they aren’t as productive when the temperature is off in some way. If you have total control over the thermostat settings (like if you work from home), experiment a bit to find out the temperature that you feel most comfortable and most productive. Those who work in offices that are notoriously cold or hot might do well to bring in a personal heater or desk fan to offset those effects. Just remember to turn them off and unplug them at the end of the day or when you aren’t at your desk to improve energy efficiency and eliminate safety hazards. Alternatively, you can bring in a cozy sweater or blanket to keep on the back of your office chair, invest in some USB-powered hand-warmers, or stock up on chilled drinks in the fridge to make the office more bearable. Harsh office lighting can really do a number on your ability to focus. The artificial, blue-colored lights we often find in our electronics and in overhead lighting can cause headaches and make you feel totally fatigued. You may want to consider swapping out those bulbs for LED lights or maximizing the amount of natural lighting from existing windows. LEDs actually provide 85% more light output yet only use 15% of the energy used by standard halogen bulbs. That means they last longer and provide a better experience. If you’re able to supplement this change with more natural lighting, you’ll probably find you’re happier, more alert, and more productive. You may also want to explore settings on your computer to minimize blue light or invest in some blue light glasses to alleviate the harmful effects of staring at a screen for eight hours a day. You can’t be expected to be productive in a space that feels sterile and uncomfortable. You’ll need to take control over the elements in your space if you want to succeed. Research shows that employees who have a say in the design and layout of their workspaces are healthier, happier, and 32% more productive. This can be something as simple as personalizing your space with artwork and plants. They can make you feel more creative and calm, which are essential for reducing stress and increasing output. You may also want to arrange your workspace in a way that keeps feng shui principles in mind or get some office furniture that’s better for ergonomics. This can make you feel more refreshed when you start work each day and feel pain-free when you wrap things up in the evenings. We often think of ourselves as slogging through the work day — and it can certainly feel that way if your space isn’t set up to be functional and attractive. But if you keep these tips in mind, you will probably feel less distracted during work hours and less burned out after a long day.